The principle behind honed out motorsports in Kansas City MO is making all the internal engine passages as smooth and uniform as possible. At Extrude Hone, we accomplish this using a state of the art abrasive flow machining process that enables us to evenly remove up to 1 mm of material from all interior surfaces of a given part. You can rely on our experienced technicians to customize the process to your exact needs. This will involve choosing the right tool (to hold your part and direct the abrasive flow), grit (to polish the metal), polymer media (to transport the grit), and pressure (to force the media through your part). Because the polymer media recirculates the silicon carbide abrasive particles, there is always fresh abrasive at the surface to deliver a highly precise, uniform finish. We can definitely hone your cast exhaust manifolds. However, no amount of honing will make a stock manifold outperform a header, so if you’re open to using aftermarket parts, we suggest adding a header instead. If you are interested in honed out motorsports in Kansas City MO, Extrude Hone is here to help. 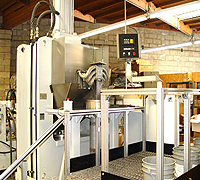 We have thousands of pounds of abrasive media on hand so we are ready for your custom project. Give us a Call us at (562) 531-2976 or contact us online for a quote including the estimated time frame for your project.